I’m sure that no other homeschool mom can relate to this…..but this year I’ve had a student turning in subpar work. I have a kiddo who is apathetic! Ugh! Isn’t homeschooling supposed to create children who are in love with learning? Reality check! Sometimes your students will be apathetic about their schoolwork. So, how can you motivate your student? I’ve tried pep talks, consequences, encouragement, and closer monitoring of schoolwork yet I’m still not seeing an improvement. This child rushes through math work and makes very silly mistakes such as adding instead of multiplying or dividing and ignoring all the remainders. The end result is a math page with mostly incorrect answers. For a writing assignment, this particular child turned in three poorly written sentences with zero punctuation, a disregard for indentation and margins, and atrocious handwriting. During science time, this child wrote out the new vocabulary words, misspelling all of them despite the fact that we had just highlighted them during our science reading. The words were bright orange and right in front of both of us. Nope. This child just isn’t trying very hard right now. This is so hard as a homeschool teacher/mom. I know exactly what this child is capable of and I know it’s much more than what I’m seeing in the assignments. So, to spur on some changes in our homeschool I’ve started giving out grades. I’m finding that having a rubric and grading policy is holding my child accountable and work is steadily improving. I also determined that if a passing grade of 70% or above is not achieved in any particular subject, then the book needs to be repeated before moving on. So, the grading policy does come with a subtle reality (or, um, threat?) of repeating a subject or a book the following year. No longer can I simply rely on allowing my child to redo work to attain mastery. I’m finding that this child was taking advantage of the fact that I assignments would be redone with my help. Apparently, it was better to have to do a paper over again with my guidance than to work through the assignments alone. It’s no longer about mastery but about responsibility. Now I’m using a very simple rubric and I’m assessing all assignments. I’m finding that having a standard set in our homeschool has forced my child to strive for excellence and want to surpass the minimum standard. Up until 4th grade, I never gave out grades but instead corrected papers with my child present so I could show the mistakes and help correct the mistakes. Then we often redid assignments together to make sure that all topics were mastered. Well, welcome to 4th grade and a student that is not always cooperative. I’m having to change my policy and take a different approach. I now issue grades for assignments in several subjects! 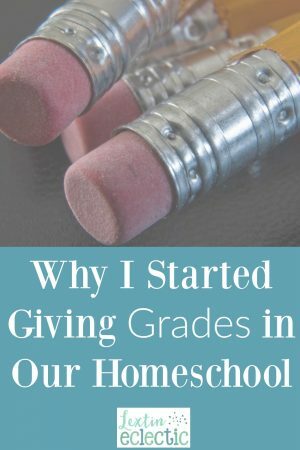 Do you give grades in your homeschool? When did you begin grading papers and keeping grade records? Great post! Would love to see your rubric if you're willing to share. I also started assigning grades this year, for pretty much the same reason. It seemed like all of a sudden my oldest two teamed up on the "I'm gonna do the very least work possible" idea. I do allow corrections, but only give half credit for those. I am trying to show them that if they get a C, and then correct everything, they still only earn a B. But if they'd done it all correct to begin with, they would have gotten an A. It's a slow process over here.